When something goes wrong with your computer, solving the problem depends more on protocol than genius. Many people have convinced themselves that they can’t handle even the simplest problems because they are not “computer nerds” or “one of those kinds of people.” But solving computer problems is a process. It isn’t a difficult process to learn, though how you apply it to problems can be as varied as the problems themselves. We’ll start with a typical problem. Our user (we’ll call him “Lawrence” since you’ll assume that’s his name, anyway) was running out of space on the hard drive of his Power Mac G4 computer. He wanted something larger. The Power Mac G4 is ridiculously easy to upgrade – the entire side of the computer opens by just lifting a latch – so he didn’t anticipate any problems. Naturally, he was wrong. Our user had done some preliminary research. His existing drive was 30 gigabytes in size, which seemed huge just a few years ago. Fortunately, drive technology has been progressing at a terrific rate, and new drives are both larger and less expensive. Unfortunately, drive technology outstripped the design specifications of the Power Mac G4: it can “see” only 128 GB on ATA drives, even if the drive has a higher capacity. This limitation doesn’t apply to the newer Power Mac G4 “Quicksilver” machines, but he didn’t have one of these new machines. But he did have a Sonnet Technologies Tempo Trio. This is a PCI card that simply slips into a slot in a Power Mac G4 (or almost any other Mac with PCI slots) and adds two USB ports, two FireWire ports, and allows you to connect up to four ATA hard drives. Our user had added this a couple years ago so he could plug more USB and FireWire gizmos into the Power Mac, as well as an 80 GB drive that was now full. He remembered reading that the Sonnet card was not limited to 128 GB. While shopping for socks one day (yes: socks), our user came to a POP (Point Of Purchase) display for a 200 GB ATA drive. The fact that vendors are creating counter-top POP displays for hard drives is nothing less than amazing; the fact that you can run into such a display while sock shopping is simply bizarre. Looking over the specifications on the outer box, the drive seemed like it would be quite at home inside the Power Mac G4: it was a fast, 7200 rpm drive with an 8 megabyte cache, and it had an ATA100 interface. There was even a Mac logo on the box. Most important of all, it was 200 GB – far larger than the 30 GB drive he wanted to replace – and it was cheap. After launching Mac OS X’s Disk Utility to format the drive, the new drive didn’t show up. Was it the Dark Side of the Force, or something more mundane? He didn’t assume it was broken. Virtually every electronics manufacturer will tell you that most “broken” returned equipment works just fine, but the buyer didn’t know how to install it or use it. He didn’t think he was “too dumb” to do such a task and start a panicked search for someone else to install it. He thought of many powerful, pungent phrases to utter, but didn’t utter them. He wondered if he’d plugged the data cable and power cable into the drive. After unplugging the eleven cables again, and dragging the computer back to the dining room table, our user opened the machine to find: the data cable was plugged in, but not the power cable. After plugging the power cable into the drive, the computer was hauled back to the desk, the cables were plugged in, and the power was turned on. This time, the new drive did appear in Disk Utility. Unfortunately, Disk Utility claimed the drive was only 127 GB rather than 200 GB. Was this a dastardly plot by the Dark Lord, or a more routine setback? As you get deeper into a problem, you may find that the problem needs to be redefined. Unfortunately, many people think “deep into a problem” is a synonym for “I’m slipping below the waves and about to drown.” If the problem takes an unexpected twist, don’t run away. Instead, follow the problem around the corner. He didn’t log in to a Web chat room and complain that he’d been sold a defective drive. He didn’t think the latest iCal update destroyed the extra space on the drive. He logged in to the Sonnet Technologies Web site and confirmed that yes, the Tempo Trio did support drives larger than 127 GB (they even have an animation showing a “120 GB” speed limit sign being shattered). He noticed, for the first time, the need for a firmware update if he had an older Tempo Trio card. Guessing that he had an older card, he downloaded the firmware update. With the firmware driver downloaded to disk, our user double-clicked on it and – the icon started to zoom out and then it collapsed. Why did it fail to launch? He double-clicked again and again the update failed to launch. The update was attempting to run Classic but, alas, our user had removed Classic at some point (probably because he wanted the drive space it occupied). He decided to install Mac OS 9 on the old 30 GB drive he was planning on replacing. This took a few minutes, and then he booted back into Mac OS X and double-clicked on the installer. Classic launched and promptly displayed a message that the firmware failed to install. Curses, foiled again. Any good diagnostic protocol should be based on observable cause and effect. Just because some Web site claims the latest security update will cause your drive to fail, your word processor to stop spell checking, and the car alarm on your Porsche to go off randomly in the middle of the night doesn’t mean any of the claims are true. Returning to the Sonnet Technologies site, our user actually bothered to read the instructions for the firmware update. They said, among other things, that the firmware update must be installed under Mac OS 9. Not under Classic. Not under Mac OS X. Given the age of the update, and the fact all Sonnet cards had been shipping with newer firmware for several years, this was not entirely unreasonable, but our user was perturbed and thought of even more pungent phrases. 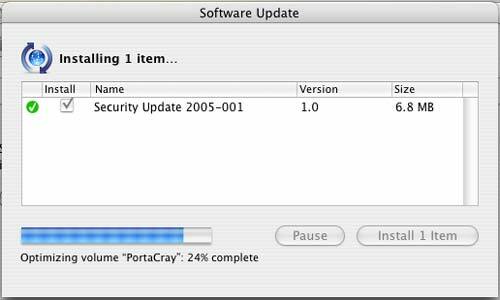 After booting into Mac OS 9, the firmware update installed almost instantly. Rebooting into Mac OS X, the new 200 GB drive showed up as a new 186.3 GB drive (200,049,647,616 bytes). Success! Our user then launched Disk Utility and told it to format the drive with zeros. This takes a long time, especially with a drive of this size, but it ensures that every byte on the drive is usable. You don’t want to find out your 200 GB drive is defective after it has been in use for a few weeks or months; take the time to write to every possible byte up front, before anything vital is stored on the drive. Do research. You don’t have to be an expert, but you should have a good idea of what you are doing, be that printing a dissertation or installing a hard drive, before you start. Read the directions. Or at least look at the pretty pictures and read their captions. If something is marked “Important!” and printed in red, you should probably read all of that section. Don’t assume an evil demon has escaped from the underworld to thwart you at every turn. Any frustrations you encounter probably have more prosaic origins. Don’t assume either your hardware or your software are defective. Most “defects” are actually misunderstandings on the part of the user. Don’t doubt what you know. When confronted with the unexpected, forgetting or doubting what you know is a guarantee of disaster. Be methodical, and stay focused. Changing your network settings won’t make your hard drive work better, and playing with the volume control for your sound won’t fix a problem with your keyboard. Develop a good diagnostic protocol. Take the fear out of sock shopping.